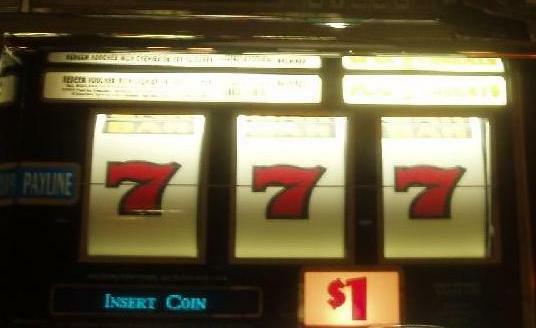 IF YOU WANT TO GAMBLE, GO TO ATLANTIC CITY. BUT DO NOT GAMBLE WITH YOUR FUTURE ANTENNA SITE! Has no ghosting problems for over-the-air TV reception . Picture quality is not affected by nearby mobile radio transmitters or the second harmonics of strong FM stations. Co-channel and adjacent channel interferences, predicted by the computer-aided TV reception study, are within acceptable limits. A computer aided TV reception study is still mandatory for an efficient on-site TV reception verification survey, providing a wealth of technical information, precise distance and direction calculations, etc. On the other hand certain shortcomings of the theoretical study cannot be overlooked. 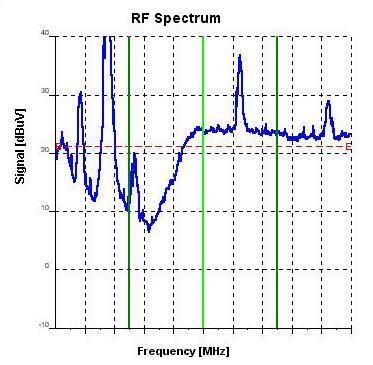 A computer cannot predict the presence of electrical (AC) interference, or its intensity, which usually is the case with the reception of distant low-band stations. The photograph above shows Channel 6 reception conditions with the video carrier in the center of the screen. 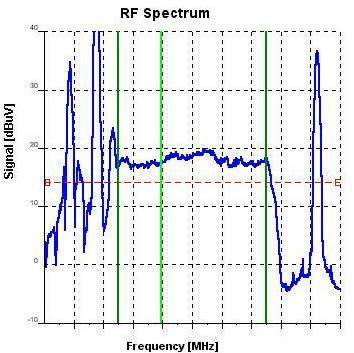 The Channel 6 spectrum is surrounded by high level (-22 dB) impulse (AC) noise, coming from a high voltage transmission line. The application of a phased-array could provide 15 dB protection, reducing the interference to a more acceptable -37 dB relative level. On the other hand another site, free of AC interference, would be more desirable. The computer cannot predict multi-path reception situations, when the signal finds more than one path from the TV transmitter to the receiving antenna. In metropolitan areas tall buildings cause reflections, while in rural areas hillsides and mountain tops are the usual culprits. Multi-path can have devastating affect on HDTV picture quality. 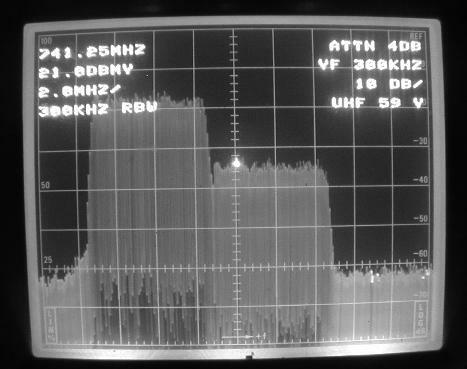 The flat, 5.5 MHz power spectrum on the left, is the ideal representation of faultless over-the-air DTV reception. The power spectrum on the right has a deep notch and a high peak, caused by reflections and other wave propagation anomalies. The HDTV pictures on that location are unstable despite the fact that the signal intensity exceeded the FCC set minimum. Co-channel and Adjacent Channel Interference Identification is another important objective of the on-site signal survey. The simultaneous operation of 800 analog stations and their 800 DTV affiliates made the 470 to 800 MHz UHF band extremely crowded, resulting in severe adjacent channel interference situations. There is only one practical way to identify potential offenders and the intensity of the interference: on-site verification testing. 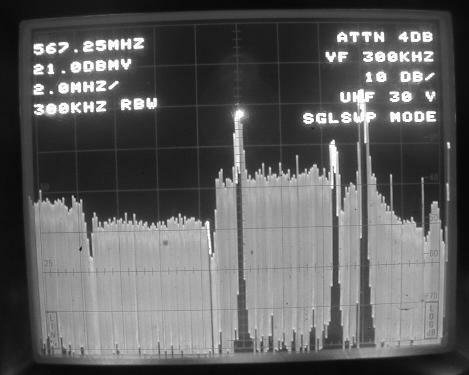 The photograph on the left shows the desired Channel 59 HDTV power spectrum in the center of the screen, affected by a 15 dB higher amplitude Channel 58 power spectrum to the left. The picture on the right illustrates another frequently encountered reception difficulty. 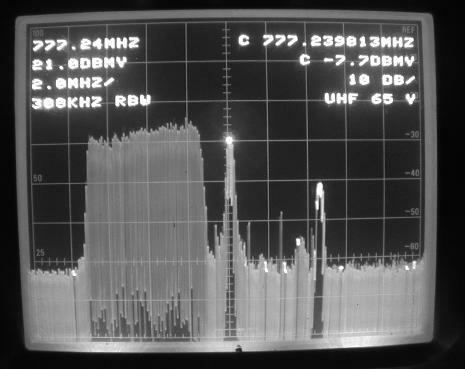 The desired Channel 65, a grandfathered analog channel suffered adjacent channel interference from the strong Channel 64 DTV power spectrum, resulting in noisy Channel 65 analog pictures. There are two Channel 30 spectrums in the center of the screen: The desired Channel 30, WPXN, New York, an HDTV station, as well as Channel 30, WVIT, New Britain, an analog station. 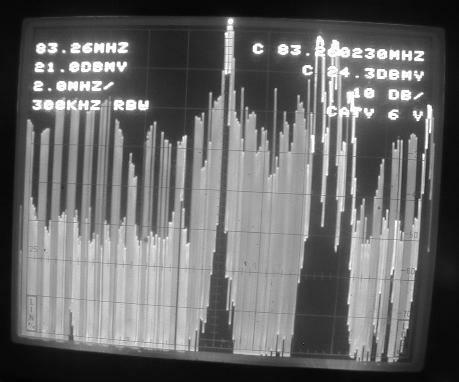 The computer aided TV reception study predicted co-channel interference problems, but only the on-site verification testing has proven that the undesired Channel 30 video carrier was 18 dB higher amplitude than the desired station’s power spectrum. The carriage of this New York HDTV station was delayed until April 2009, when all US analog stations should leave the air. Radio Shack Antennas Need Not Apply. A professionally conducted on-site TV reception verification survey requires the application of professional, high quality, proven performance antennas. At Biro Engineering we use separate Low-Band, High-Band and UHF test-antennas, rotor-mounted on a 40’ high telescopic mast. These high-gain, high directivity antennas make possible the fast and reliable testing of potential interference problems, simultaneously delivering high quality HDTV pictures for subjective evaluation purposes. True, an on-site signal survey is not sponsored by the Ford Foundation. However, the cost benefits of the survey, such as a shorter antenna tower than projected by the theoretical study or parabolic antennas providing the simultaneous reception of Analog and HDTV stations, could very well more than compensate for the costs of the verification survey. And last but not least, in the event of major problems with the proposed site, it is much better to discover them before signing a lease, making a deposit, or building a tower.